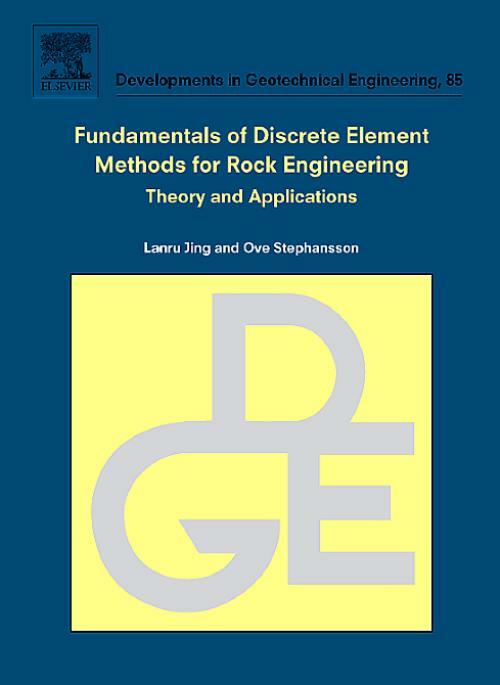 This book presents some fundamental concepts behind the basic theories and tools of discrete element methods (DEM), its historical development, and its wide scope of applications in geology, geophysics and rock engineering. Unlike almost all books available on the general subject of DEM, this book includes coverage of both explicit and implicit DEM approaches, namely the Distinct Element Methods and Discontinuous Deformation Analysis (DDA) for both rigid and deformable blocks and particle systems, and also the Discrete Fracture Network (DFN) approach for fluid flow and solute transport simulations. The latter is actually also a discrete approach of importance for rock mechanics and rock engineering. In addition, brief introductions to some alternative approaches are also provided, such as percolation theory and Cosserat micromechanics equivalence to particle systems, which often appear hand-in-hand with the DEM in the literature. Fundamentals of the particle mechanics approach using DEM for granular media is also presented. discontinuous deformation analysis (DDA). 10. Discrete Fracture Network (DFN) method. 11. Discrete Element Methods for granular materials. Part 4: Application Studies. 12. Case studies of Discrete Element Methods in geology, geophysics and rock engineering. Appendix. Subject Index.